Home > Questions > Why do anti-wrinkle injections make me sneeze? We estimate that 30% of patients either sneeze or feel like they want to sneeze when the frown is treated. This article will explain the science behind a sneeze and why anti-wrinkle treatment can trigger it in some people. Before we look at anti-wrinkle treatment, lets have a brief recap of why we sneeze. 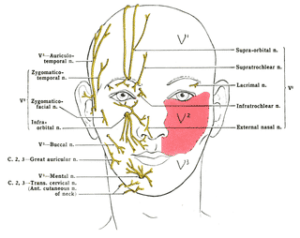 Sneezes are triggered by stimulation of the trigeminal nerve, one of the cranial nerves which supplies the face (shown in the diagram below). Anything that stimulates branches of the trigeminal nerve can make you sneeze. Plucking eyebrows and nose-hairs are good examples of treatments that can trigger a sneeze. Eating strong mint or exposure to bright light can bring on a sneeze in some people. 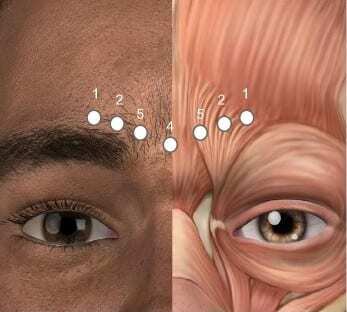 When we treat the frown area, as shown in the diagram below, we are injecting small amounts of anti-wrinkle product into areas supplied by the trigeminal nerve. It is a very sensitive area, especially the injections at the outer part of the glabella (shown in the picture below as numbers ‘1’ and ‘2’. The illustration below shows treatment with 20 anti-wrinkle units to the glabella (frown lines). Injecting the frown with small needles can stimulate the trigeminal nerve and trigger a sneezing response. Some patient just feel an urge to sneeze or a tickle in the nose. This is normal. 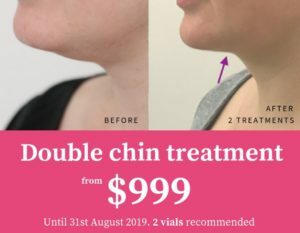 Unfortunately there is no way that we can minimise the chances of you sneezing when you have anti-wrinkle treatment. It happens to some but not to others and this is just the way you are made. The good news is that it does not impact on your treatment or increase the risk of a lazy eye or brow droop.